Quote: "The more you trust, the less likely you'll survive." Profile: When people seek information on rumors, people refer to a boy who is often in the streets with his guitar, Wataru Hashimoto. 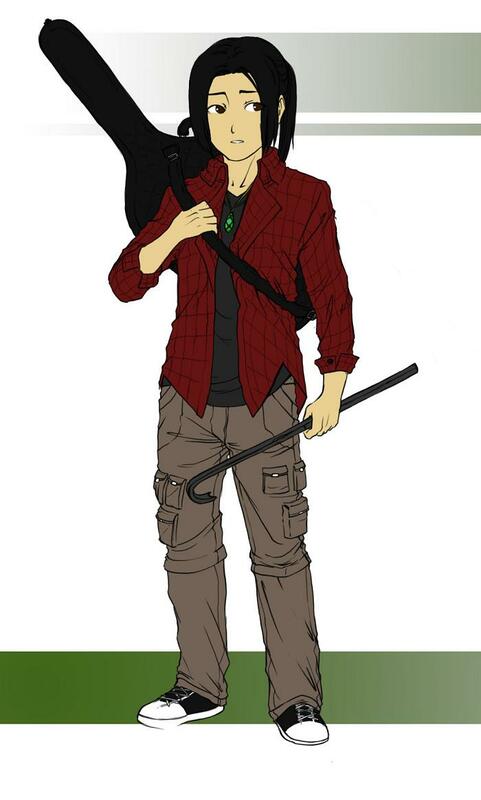 He is a rumormonger and courier-for-hire who gives information in exchange of either money or information. 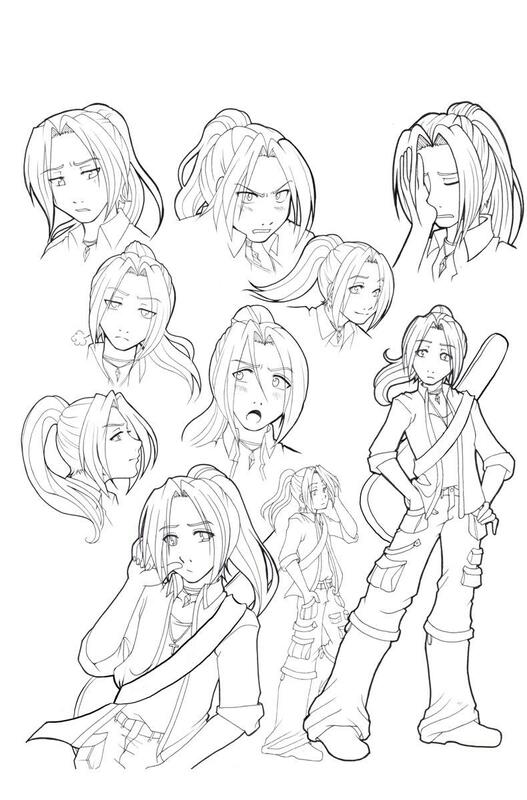 Personality: Wataru is a young boy who is neither friendly nor trusting towards strangers; he is as prickly as a blowfish. He is the paranoid light sleeper-type; sleeping with one eye open and a glass shard on hand to stab a nearby intruder at the throat. He often appears rather surly and sometimes sullen. Survival being the biggest thing to him, he is slow to trust any strangers, fixing them with wariness. When he speaks, he is rather terse in his statements. 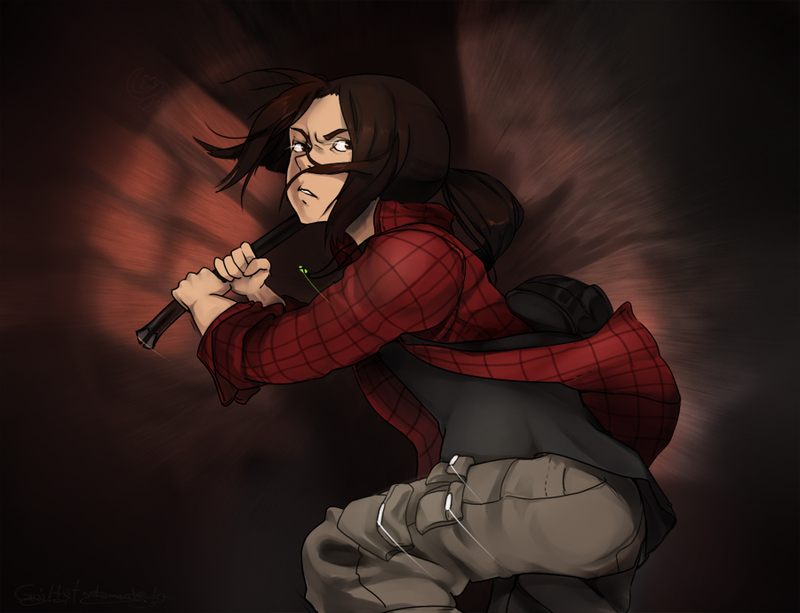 If he doesn't trust the person, he is quick to become apprehensive or very abrasive if they come near him and starts swinging the crowbar. And he bites. Not in a good way. He may, however, find the person interesting enough to be a bit amiable and follow them around, if still wary. However, if he grows to trust the person, he'll be more open and receptive to them. He is more likely to take the person's side. With that person that he'll trust, he will not want to let them go. As one person put it, trying to befriend Wataru is like trying to befriend a very dangerous stray puppy. Due to the life he was raised in a demon-infested world, Wataru has come into grips their belief: Only the strong can survive and the weak will only be consumed. Death is considered a fact of life and no longer worth blinking over. He seeks to amass power, even bending the will of demons to serve him through show of power. Wataru originally hailed from Chiba, Japan. The life that he lived was an ordinary one, where he had a father who worked at a music industry in Tokyo(Todasu), a mother who was a housewife and a former police officer(Hisoka), and an older sister, who was the closest friend that he had(Makoto). 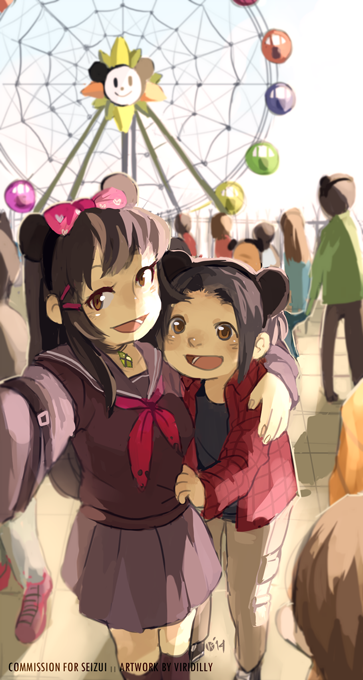 They always visited Tokyo together, able to enjoy their time there. 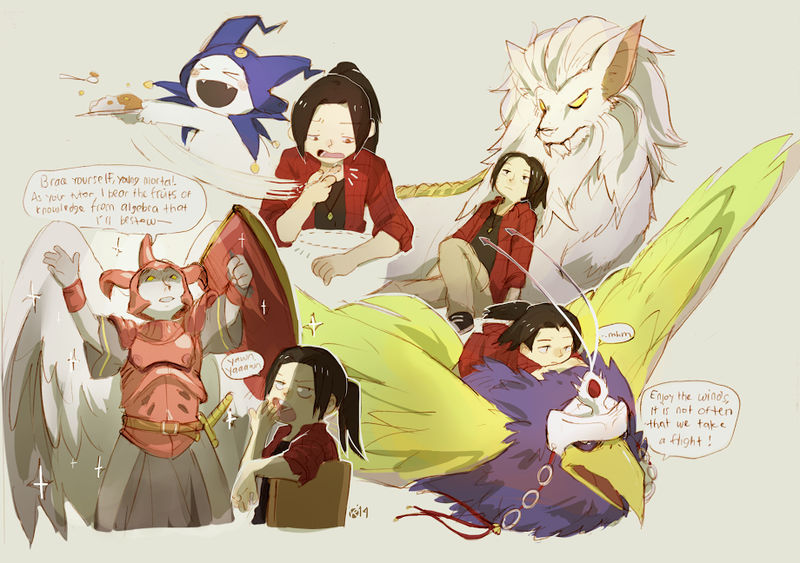 Wataru grew up not having too many friends, mostly because he was rather difficult to get along with. He was wary of strangers touching him. However, those who did grow on him, he did warm up to. Everything seemed to be an ordinary life for him. When Wataru was 8-years-old, his family went to Tokyo for a big event. Many of Wataru's friends were there. Unfortunately, that was when the lockdown occured. Wataru, his family, and friends had to hide within the park and endure the hardships of being forced to endure the ordeal. It all went out of control. On top of riots that occured in the isolated area, demons emerged. 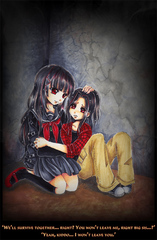 As people fled, Wataru's parents pushed him to his sister and told her to take care of him. While his parents tried to fend off the demons, Wataru saw them slaughtered before his eyes. To top it all off, when Makoto and Wataru escaped, they bore witness to the explosion set off. 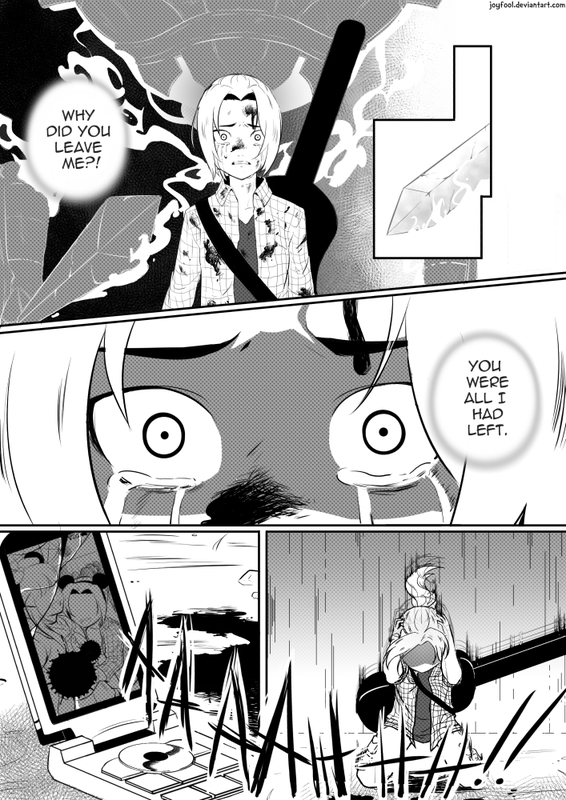 Everyone that Wataru knew were gone. It left him shell shocked. This was a first taste of despair. It took many years for him to recover, especially after learning that Makoto had a device that allowed her to summon the same demons that killed their parents. To him, it was an act of betrayal. However, he eventually came around after her convincing. 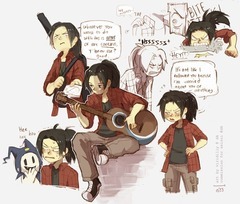 Makoto would always calm her brother down with a song from her guitar that she received when she was his age. He distrusted the demons that she had as well as the other Demon Tamers that she hung out with. They eventually grew onto the boy, especially his sister's demons. Years passed by, bringing Wataru to be 12-years-old. He grew used to the Demon Tamers and their particular organization. He's seen the good and bad tamers, but was not allowed to come along on the missions that the Tamers do. Granted, he often followed them, landing him into some trouble. Yet, his sister would always be there for him in the nick of time. She always relied on her lucky pendant, always telling him that they are still alive through their luck. However, one mission was different. It was the only mission that she did not carry her lucky pendant. She left her lucky pendant behind on Wataru. He later woke up and rushed out to look for her to give her the pendant. 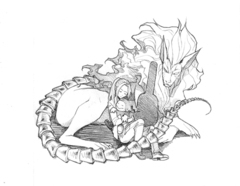 When he arrived, he saw her(along with Cerberus and other demons) fighting the bad demons. Makoto's demons got incapacitated and then she was hit with a miasma before she slew the demon. 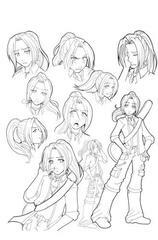 Before Wataru's eyes, she started to to slowly transform into a demon/or get possessed. 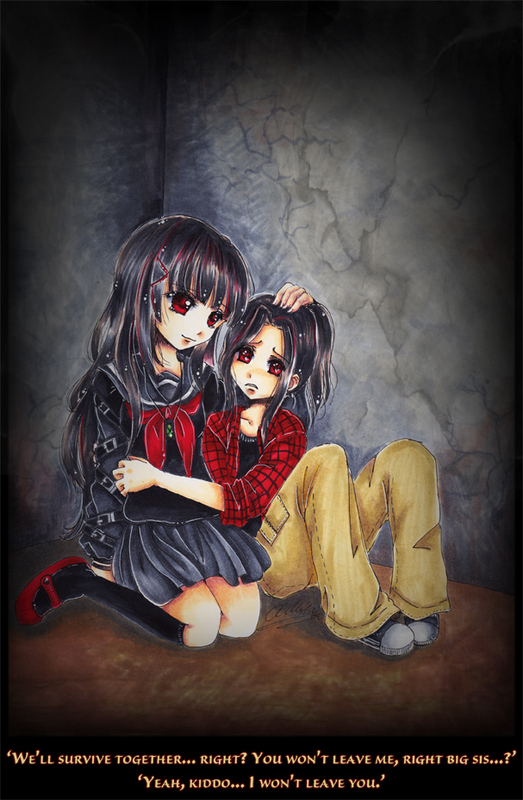 Wataru was her first human in sight and she was creeping up to kill/devour him. Wataru grew frighten and was up against a corner. Cerberus was too injured to intervene. 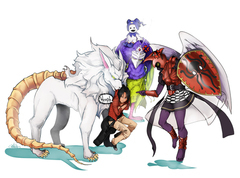 A Guardian Spirit(kinda like a Persona) emerged from Wataru to protect him. However, that meant slaying his sister before his eyes. 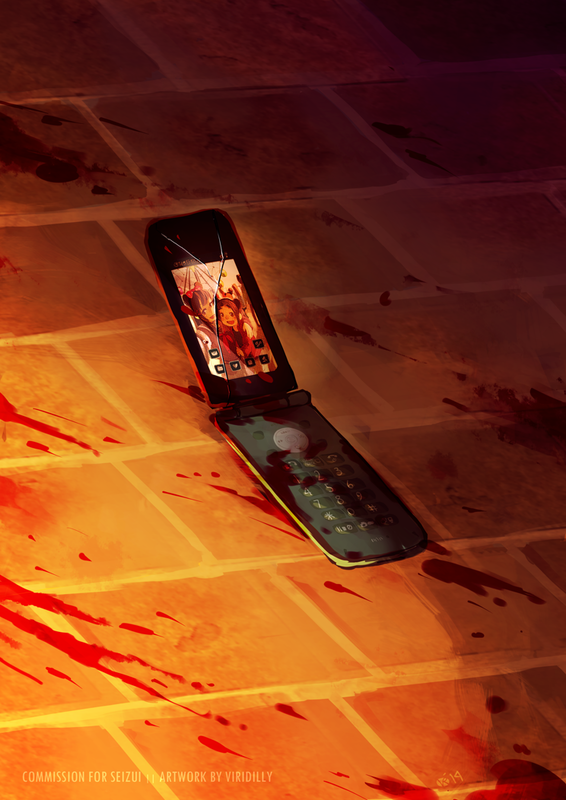 This was Wataru's breaking point. 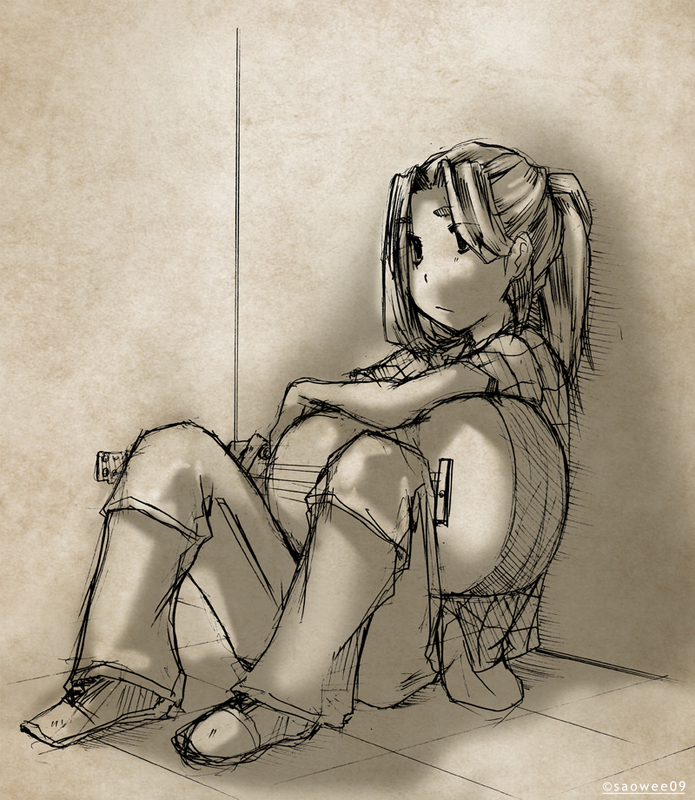 Any desire that Wataru had to survive was tarnished at his older sister's death. 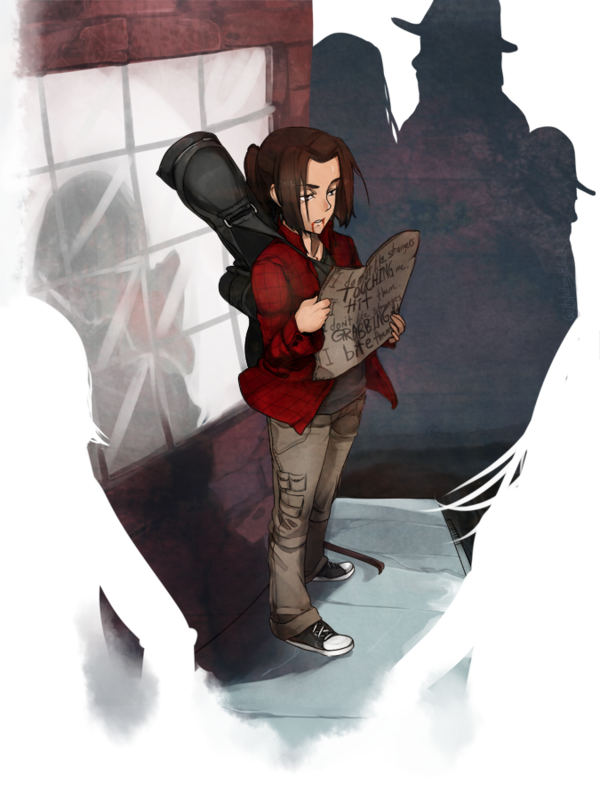 Down on his luck, Wataru attempted to live day by day, but he found himself awaken in an abandoned, sealed building with 10 other people. This is where Wataru learned the hard way that he could not trust anyone. First was an older sister-figure who promised to protect him, but she was the first murderer. It was her advice, telling him not to trust others, that Wataru tried taking to heart. Despite that, he did take upon himself to protect a girl who was about his age. The girl kept him isolated from the others so that he would be her guardian. The girl attempted to kill him, but he caught her off-guard. He did not kill her, but told he that was no longer under his protection. She was murdered by someone else, who turned out to be her best friend. 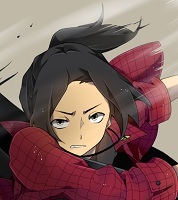 Wataru's demeanor became surly and distrustful. The final trial, they met the Mastermind: A Diet member. The condition of winning the trial was that all wanted to live. The Mastermind had an ace up his sleeve: Showing Wataru that his very reason of participating in the game was all for naught. His sister was killed. Wataru was ready to give into despair. Now, Wataru is left alone, only to fend for himself. 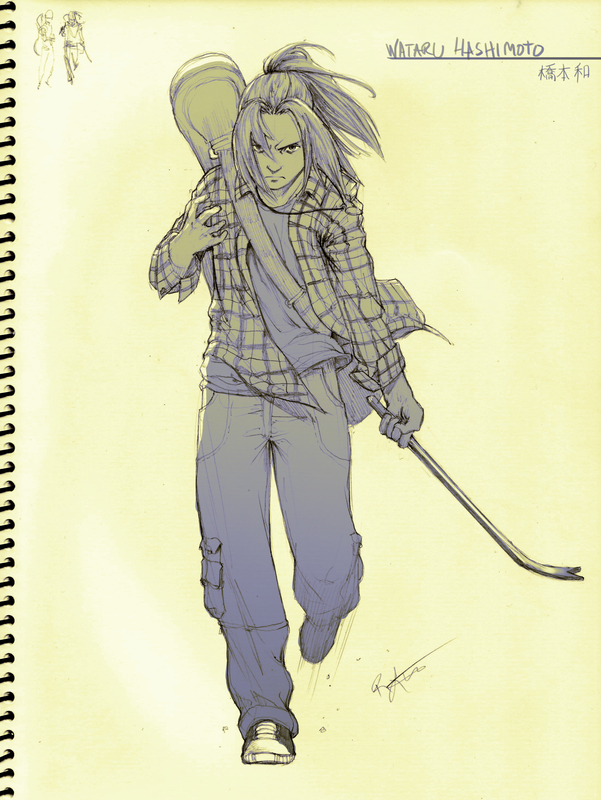 He carries his sister's pendant, guitar, and her COMP. The demons that were previously hers now belong to him. 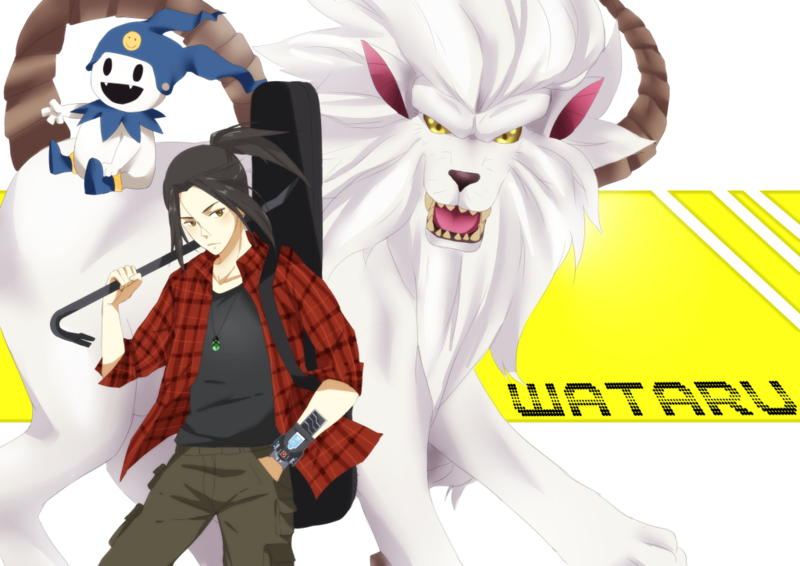 With no one else to trust, Wataru has to rely on the demons that he grew up with for advice. He is an inexperienced user, but he will do what he can to survive. He has taken up the job of being a courier. He generally gathers information and rumors through his busking routine, but he also retrieves information and trades with particular people of interest, whether by money or information. However, his heart has grown heavy. He has lost his friends and family. 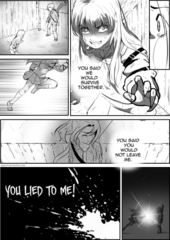 With everyone that he knew gone, Wataru feels like he can no longer trust anyone but himself and his demons. And only his hatred to guide him. 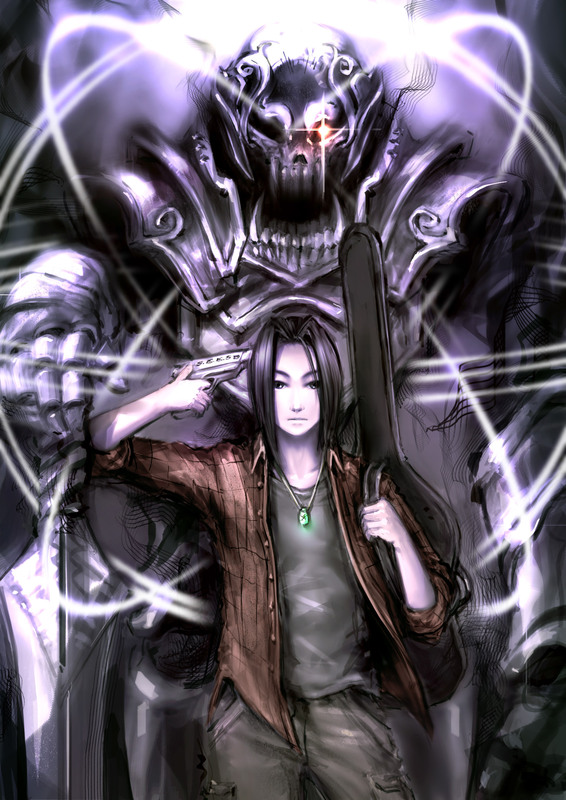 His anger towards the angels for the death of his friends and the demons for the death of his family. Wataru maximizes both his Strength and Magic growth without favoring either, while sacrificing his Vitality and Agility in the process. A Guardian Spirit is a being from Makai that exist to protect those brave enough to face against the demons that inhabit the world. They differ from the demons in that they do not communicate with the host that they infuse and that they only manifest when the host's life is in danger. They are formless spirits that, when infused with the host, take the form of a construct based off of a god, demon, or legend that represents the host. Wataru's Guardian Spirit is Agravain, one of the Knights of the Round Table, who matches Wataru in terms of malice and yet, kindness. + !Death: For better or worse, Wataru is unable to be killed. Agravain's presence ensures that Wataru is able to stand. + Magic: The Guardian Spirit imbues its user to utilize the dark art known as magic. + Agravain's Passive Gift - Eyes of Truth: This ability allows Wataru to see all things as they actually are. It allows him to see through the normal and magical darkness, illusions, invisible creatures or objects, and the true form of those polymorphed or transmuted. However, this doe not allow him to see through mudane disguises or concealment caused by fog. + Critical Moment - Brave Blade: Upon Wataru being at a critical state, Agravain will manifest and strike down upon the offending enemy with its gigantic dark sword. 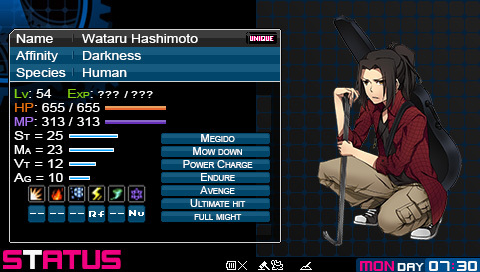 (NOTE: Wataru has to be less than 25% health). This is is a portable computer that allows the user to communicate with, transpot, and summon demonic entities. 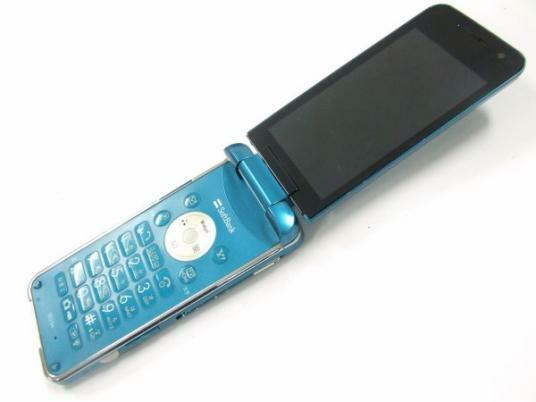 This version of the COMP is a cellphone based off of Softbank's AQUOS Shot 002SH model. If the COMP runs out of battery power or breaks, a Demon Tamer loses his/her demon contracts and in turn will also make them vulnerable to demon attacks due to the disengagement of the mind link to the Harmonizer. The Demon Summoning Program can also go berserk, creating portals for demons to freely emerge. + Demon Summoning Program: As the name states, it allows the user to summon demons. + Translator: This bridges the gap of communication with demons. The wielder of the COMP can understand and talk to the demon. + Harmonizer: This tunes the wavelengths of humans, making attacks effective against demons while increasing the survival against demons' attacks. It affects all humans and demons that are within 120m(390ft) range of the COMP. + Devil Auction: Allows the user to task of forming contracts with demons. Demons make themselvs available as merchandise to be bid upon by the members. The winner can make a contract with the demon. + Skill Crack: This function analyzes an enemy's ability and saves it into the COMP. When it's locked onto the skill, the COMP-user has to defeat the demon in order to unlock it. When the Demon Tamer defeats the enemy with the skill, it becomes registered into the Spell System program. The program allows 3 Skills, but they can be switched out prior to battle. + Demon Fusing: Cath.exe allows the user to access the Cathedral of Shadows, an organization existed for many years for the purpose of fusing demons together in order to create new demons. The program allows access to the network and fuse the demons registered into the COMP. 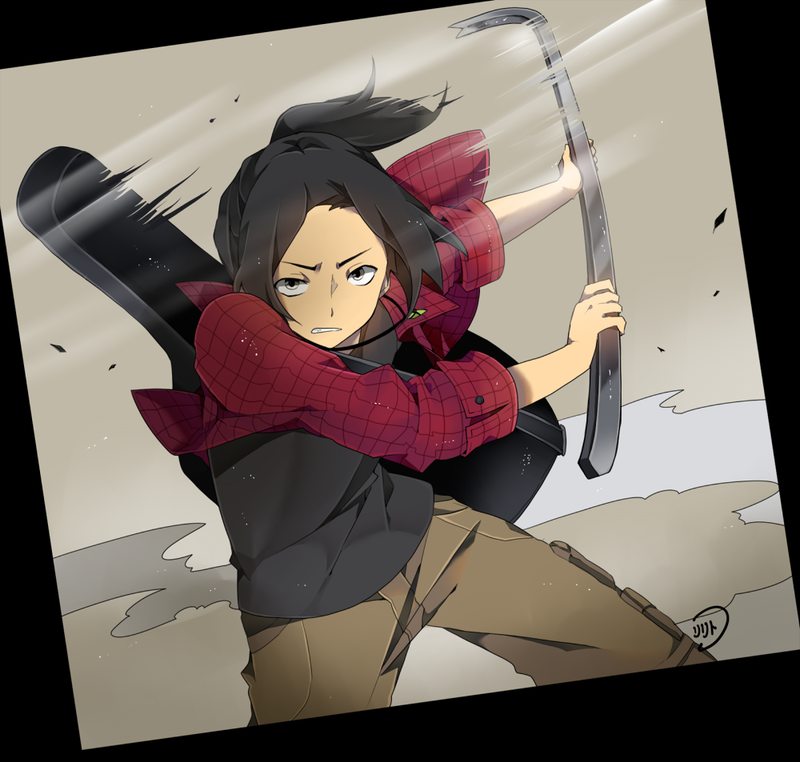 Weapon - Crowbar: This is Wataru's weapon of choice. It is one weapon, millions of uses. Street Smart: Wataru has a good knowledge of the streets. He knows every inch of the alleys. This gives him an advantage of knowing short-cuts within the districts to make a dangerous path less so. 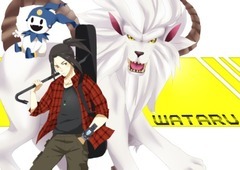 Information Gathering: Generally, when Wataru busks, he is often listening to chatter to get rumors that have spread. He is generally good at keeping quiet and listening for details. 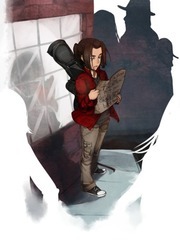 Wataru earns his mark as a Rumormonger and a Courier; from gathering information passively to performing reconnaissance work to retrive information. 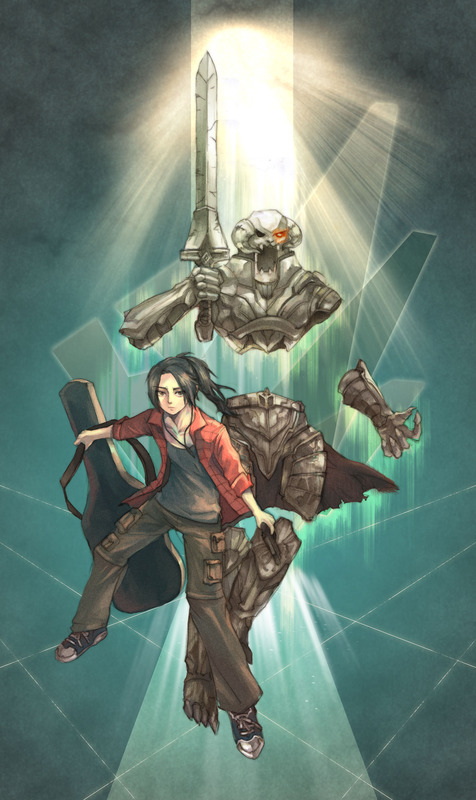 Perform Skill - Acoustic Guitar: Wataru is phenomenally skilled at using the acoustic guitar. He can perform many songs on the spot without much practice needed. Quote: "I am thy guard, thou art my child. Remain strong, for thou bearest the responsibility of being strong." 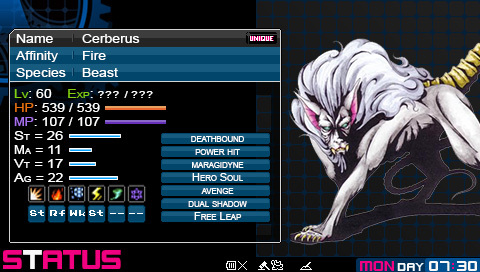 Personality: Cerberus is a noble, fearsome creature who speaks in Old English. Although very serious, there is a paternal nature to him. Relationship: He is the surrogate father to Wataru, always first to jump to the boy's aid. He is also quick to grab the young Demon Tamer by the scruff of his neck like a cub if he acts up. Cerberus considers Wataru his cub and will guard him with his life. 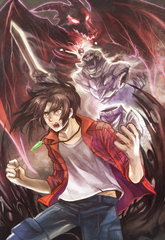 Wataru depends on Cerberus, as he is one of he few people he has left. He often uses him as a pillow when he sleeps and rides on his back. Cerberus is the only reason why the Demon Tamer's morality is in check. If anything was to happen to Cerberus, Wataru would lose the best influence that strays him from going a darker path. Quote: "Be grateful child, I bestow the wisdom of Heaven upon you. …Please stop doodling in the margins." Personality: He is serious and dignified, yet seems very formal and pompus warrior scholar. He carries pride in his role as a scholar and a protector. Relationship: Power, being the scholarly angel, oversees Wataru's education. Given that the boy is unable to cope with society, Power ensures that the boy gets a proper education. However, he is not fond of reducing himself to a home tutor. Wataru does not take Power seriously, often intentionally undermining him. This annoys the angel, who tries to make sure Wataru gets knowledge to help Wataru grow to be an adult. Deep down, even if he doesn't seem like it, he is taken to the boy. Quote: "Young child, you must break away from your barrier. There are people that wish to be your friend. They can only go far in their efforts to reach out to you, so do try to extend a hand. …And not bite them, it's rather unbecoming." Personality: Although serious, Suparna is kind and dignified and much more laid back compared to Power. There is a gentle spirit in the creature. Yet, his fearsome wrath can be call upon to those who disturbs the balance of the world. He is also the voice of reason between the group. Relationship: Looking out for Wataru, he wants the boy to come out of his shell and get involved in the world, just as long as he doesn't disrupt the balance of the world. 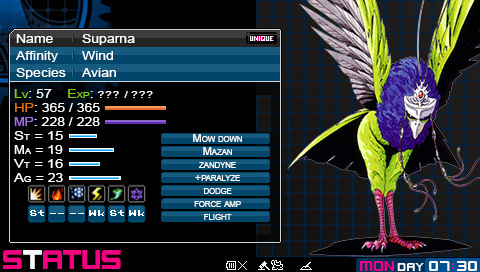 Wataru generally uses Suparna for flight, always climbing on his back. Quote: "Alright kiddo! Let's hee-have some fun-ho! We'll hee-play some games, ho!" 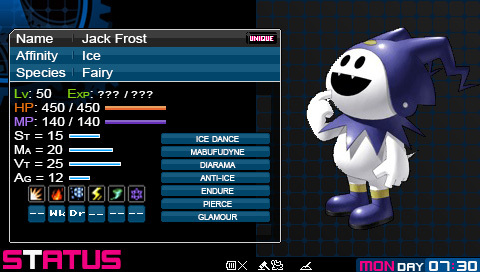 Personality: Where as the others are more serious in nature, Jack Frost is very playful and jovial. Relationship: Due to Wataru's seriousness, Jack Frost generally offsets that with its comical nature. Wataru is not nice to his Jack Frost. He often tries to keep the fairy at arm's length to ensure that the demon does not stray too far and cause an unnecessarily mess. Jack Frost tends to undermind Wataru but cowers when the boy is prepared to beat him up. The demon just wants the boy to have fun and to try to get him to smile. He knows that his master has not smiled in a long time. Like the other demons, who look after Wataru, Jack Frost's reasoning for causing a mess is to get Wataru to socialize with society… and to have fun at the process. With the other three being so serious, he often plays practical jokes on the other three, much to their dismay. 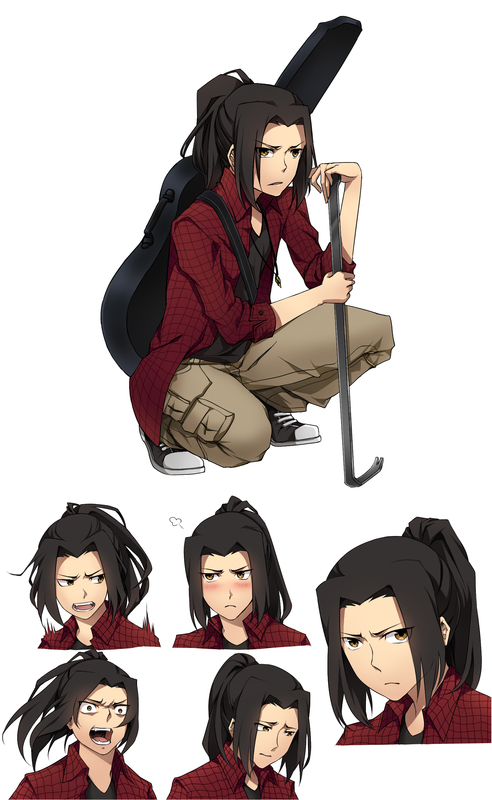 Surly Attitude: Wataru is not the kindest person to be around. He carries a surly attitude, which will likely put off many people. Does Not Like Being Touched: He does not respond well to people touching or grabbing him. While simply touching him is likely to get the hand smacked away, grabbing him is going to provoke him to bite the individual. Fear (Large Crowds): Wataru does not do too well with large crowds when they surround him. He begins to go into a frantic panic mode, trying to figure what to do to get out of it. Single-tracked mind: He tends to focus on one task at a time. When he does that, he'll develop tunnel vision towards that particular task. 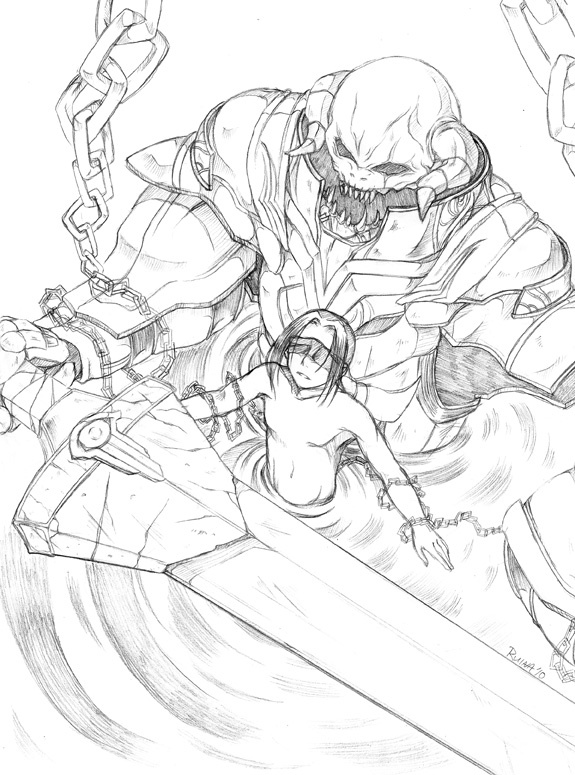 Berserker: He is silent, he is furious, and everything in his sight is his desire to see destroyed. Particularly, he is likely to focus this on one person. This goes along with his tunnel-vision flaw, except that anyone who gets in his way when he is focusing his rage on a particular person will be included in Wataru's target range. Feral: Wataru tends to act feral when he's backed into the corner. He'll hiss in warning and will bite when provoked. If backed into a corner, he'll really become feral. Paranoia: The Eyes of Truth affords Wataru to see past the glamour. However, growing up seeing nothing but demons has done nothing more than skew his ability to sleep. Living in a demon-infested world has only left the boy with a lot of nightmares. This has left Wataru a bit neurotic and with paranoia. 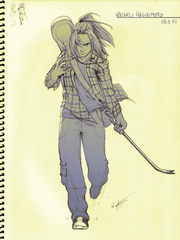 Wataru serves as Major Character who is rather powerful in the beginning, acting as a guide for the main characters from helping them learn their about powers to providing them them information through navigation of the streets. However, you'll learn that he becomes an enemy after certain events. 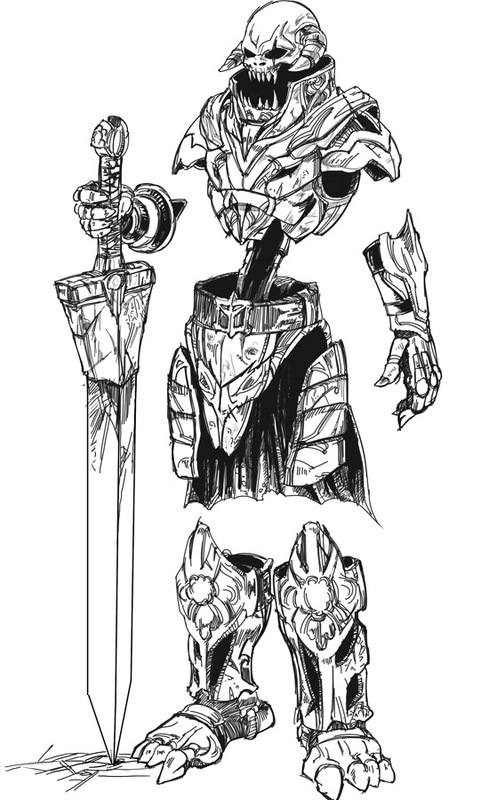 He can either join back as an ally or die as an enemy based on what path is chosen. This is more geared towards Neutral and Chaos. What I envisioned this character being type who will ether join you or will be one of your boss-type enemies. If Law, becoming God's will: Wataru will not rejoin with the group and you will lose him for good. If Neutral: Wataru is likely to join back depending on the story. If Chaos, leading the war against God: Wataru is likely to join back depending on the story. Essentially, Wataru is Neutral. However, he can easily go towards the Chaos Path if it means going to war with God and his angels. His main motivation is Revenge. At Fate 1, Wataru gains Curse resistance; at Fate 3, he unlocks Touki Berserker (Lv 38), and at Fate 5, Genma Lugh (Lv 57). Wataru's Fate events center around coping with his inability to let go of the past, especially concerning the fate of his family and friends, and more importantly, what happened between him and his sister. 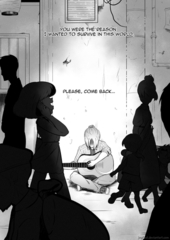 With the help of the group, Wataru learns to move forward and become a little more open. 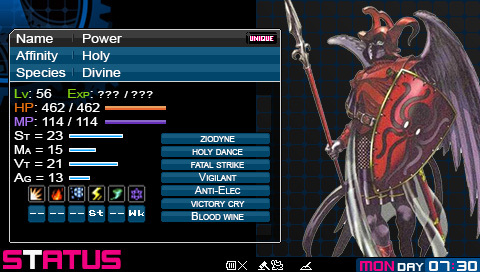 This is an AU concept based off the combination of two bad endings of Devil Survivor 1. This story is about 5 years in the future after the main cast escape and the Yamanote Line is wiped. 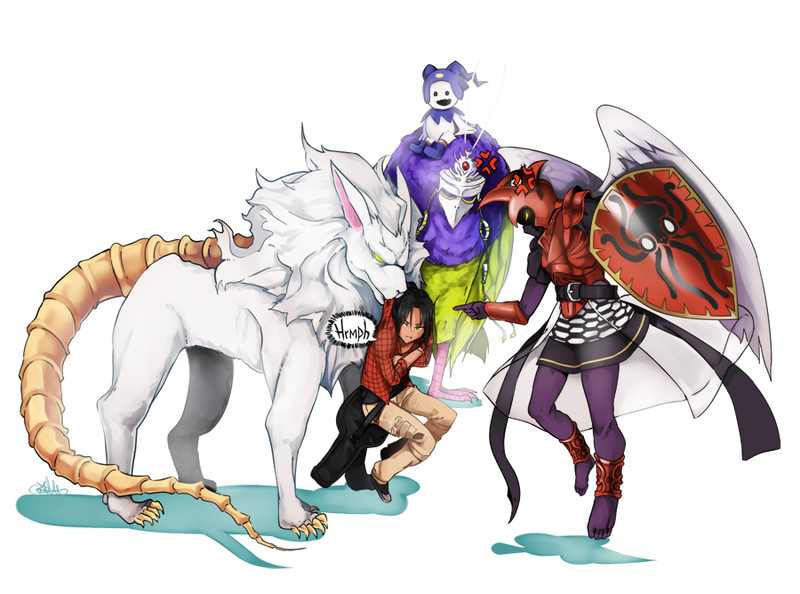 This is to give it a Shin Megami Tensei I vibe, the mystery of demons existing in the land of man. Demons have existed in our world for years, yet humanity have been unaware of them, given that the barrier between Makai and the human world have been sealed for generations. However, that barrier was circumvented with the construction of the BAB-EL Server, creating a rift to allow demons to enter the human world. In 2007, it started as an isolated incident at the Yamanote Line of Tokyo where the military barricaded the area. Unfortunately, it grew out of control to the point that an explosion ignited, described as a high explosive set off by the poisonous gases that leaked out. This resulted in the 'Great Yamanote Catastrophe', killing over a thousand of people. This caused an outrage amongst the citizens of Japan over the government's failure of such a magnitude. This allowed a corporation to grow and ease the wounds of the people for their loss, starting with the reconstruction of Tokyo. That corporation would be the corporation that everyone would depend on, GenTech. Years passed where people have moved on from the event. However, things are not what they seem to be. It's 2012; Tokyo continues as normal. The world has grown dependent upon the mega-corporation known as GenTech, which has offered many products from pharmaceutical to food. Their goal is to improve mankind through any means. The Corporation has an alliance with the Government. Yet, at the same time, there are underside of the government that are suspicious of GenTech. There has been the rise of the church, along with the increased activity of the Special Defense Force(SDF) and police. Demons have hid from the human populace, taking the forms of the humans that they live amongst from gangsters to even school teachers. Those that cannot blend in stalk in the shadows to keep out of the eyes of the public. The Shomonkai exist to spread the word of their God to try to keep people united. Then, there exist the Demon Tamers, who have strange devices called COMPs that allow them to communicate with and summon demons. There are those who seek to fight the demons while others use them for their own purpose.